Sounding refers to a mechanism of probing the environment by sending out some kind of stimulus. The term comes from the ancient practice of determining the depth of water by feeding out a line with a weight at the end — making a sounding. My drawings in this exhibition focus on measurement and probing. A ping. Each series of marks is made by filling a tool then making marks until the ink is gone. Each mark seems to take an eternity. I touch the surface, make the mark, and then move away. In this work the process defines the outcome. It is minimalist, repetitive, and iterative. More than any of my other work, there is an absence of thought. Loss of concentration creates the unexpected. The unexpected however, is embraced. La Mer explores life of the ocean from the bioluminescent creatures of the abyss to the exquisite and mighty microscopic beauties in the sunlit zone. 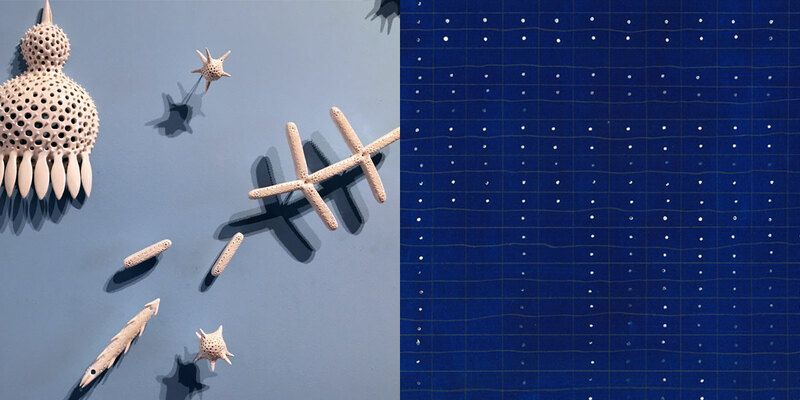 Stars for Stella illuminates this microscopic marine world. These single cells photosynthesize most of earth’s oxygen sustaining all life as the primary producers of our ecosystem. Many cells form colonies and strands to empower their oxygen prowess and mutual support. The central star plays on the actual architecture of individual diatom species connecting as one exquisite cluster. The petit stars are the remains of protozoa that leaves behind magical star-shaped sand found on the shores of Okinawa: Hoshizuna No Hama/Star Shaped Sand Beach. The universal connection and interdependent element that has enabled all life to thrive for eons is the underlying rhythm of my practice in sculpture, teaching and community arts. This work intends to uplift joy and awareness - informing wise, timely sustainable investments. The intricate ceramic forms shine light on the wonder as well as the delicate, diverse and mostly unseen, little known life of the sea with which our lives are intrinsically linked.